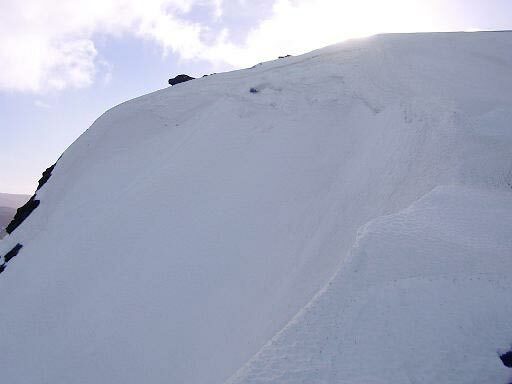 The top of Beinn Achaladair consists of a curved ridge connecting the summit with the South Top (1002m). It is a mountain with fairly steep slopes leading to higher rocky outcrops and crags. From the summit a craggy ridge runs NNE and offers an ascent route (minor scrambling) from the Crannach woods, but the more usual route is the rocky ENE ridge which connects to Meall Buidhe leading to Beinn a' Chreachain. From the South Top the ridge descends S to a broad bealach at the head of Coire Daingean, from where a descent can be made through Coire Achaladair to Achallader Farm. Beinn Manach can also be accessed from the S ridge via the bealach at the head of Gleann Calliche. 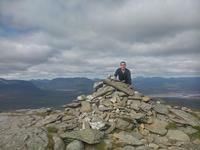 Beinn Achaladair summit.Loch Tulla distant. Beinn Achaladair from Crannach Wood. The summary information of one or more ascent routes that include Beinn Achaladair. 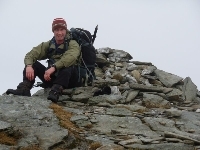 Post a few words about Beinn Achaladair or read what others have had to say. Looking along the ridge and Coire of Beinn a Chreachain reveals a magnificent view ahead but also a strenuous one to reach Beinn Achaladair with its summit Cairn perched close to a cliff.Desending from Meall Buidhe then the sharp pull up was the most stunning view of the day.Great view on to Loch Tulla,over to Beinn an Dothaid.Beinn Dorain and the Auch Corbetts makes this walk a rewarding one.There appears to be now easy way down.The very steep North face of Beinn Achaladair should be considered with care.I dropped to the South top where some height is lost and went down to the west highland railway and back to the Farm.Still steep but less terrifying. My map also shows the more westerly 1038m as the summit. 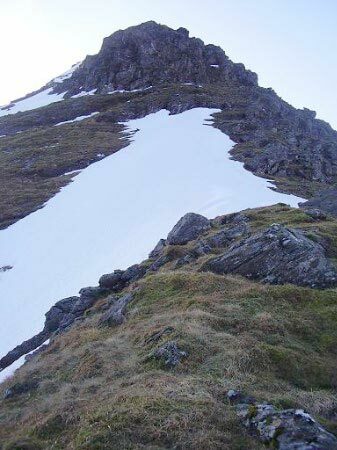 when i continued to the cairn at 1036m and looked back it seemed that it was lower than the rest of the summit ridge, although i couldn't really pinpoint the 1038m summit when i was there! On our walk, there was some confusion as to where the actual summit of Beinn Achaladair was. One of our party had an OS map showing a summit at 1036m and another summit at 1038m a couple of hundred metres along the ridge. 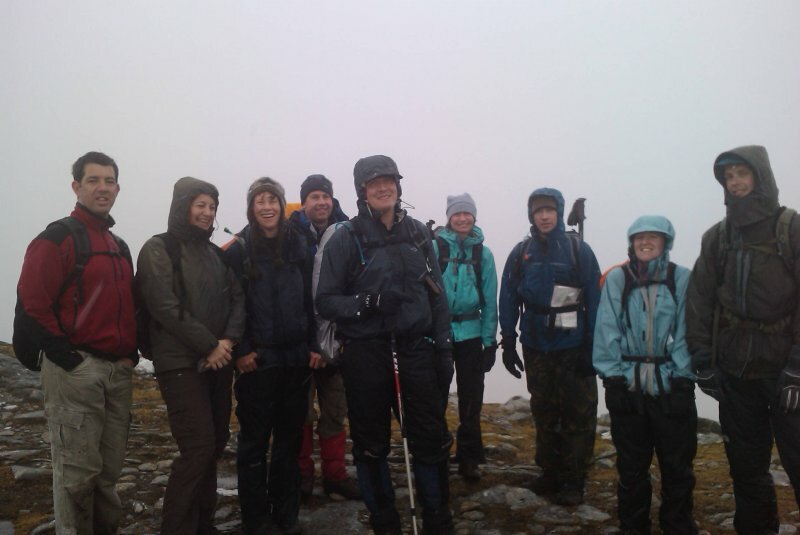 Our walk leader had a map which showed only the 1036m summit. According to my satnav - which has a 1:50 OS map built into it and also showed two summits - the cairn has been built on the 1036m summit. Coming down off of Beinn Achaladair via the south ridge to the bealach with Beinn an Dothaidh, in wet conditions, is very treachorous when you duck down into the Coire. It took me almost as long to come down as to go up, what with slipping and sliding on horribly loose topsoil on and around the path. Allow an extra bit of time if its wet. The waymarked path through Crannoch Woods is very well signposted and the path itself in excellent condition. Following it leads you directly to the easiest route up the North East ridge keeping to the east side of Loch a' Chreachain.